A game where you have to avoid bubbles for as long as you can. And it all fits in a tweet. 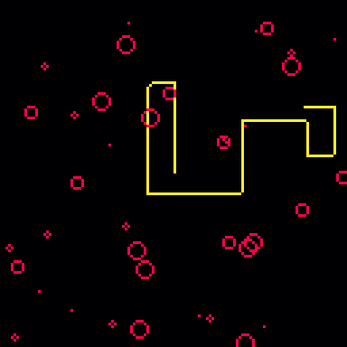 Fun take on snake - I like that you actively want to avoid objects in this one, instead of collecting objects! Amazing that you fit it in 270 chars, that's really impressive! Nicegame! It reminds me to snake but still it is kind of addictive. Good job!